What happens when pilots lose the plot? 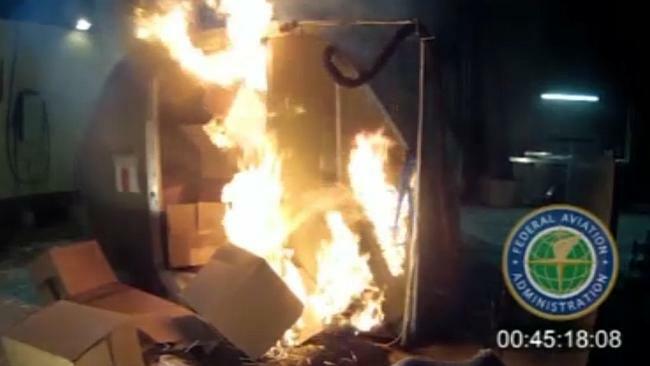 THE sort of batteries suspected of igniting a fire on board MH370 have been banned from aircraft cargo holds at Qantas and Jetstar for safety reasons. Virgin Australia and Tigerair are expected to shortly follow suit and also ban shipment of lithium-ion batteries which have been known to catch fire when overheated. Earlier this month, American carriers United Airlines and Delta took the step of banning large shipments of the batteries which are commonly used in mobile phones and iPads. Despite the move against lithium-ion batteries, the ban is not a regulatory requirement. However, the International Civil Aviation Organisation (ICAO) is reviewing its position in consultation with carriers, and the US Federal Aviation Administration which recently published new research on the issue. In tests undertaken at the FAA's technical centre in Atlantic City last year, fire broke out in a cargo container packed with 5000 lithium-ion batteries, prompting aircraft manufacturers to declare the devices an "unacceptable risk". Although there is no proof a fire caused the disappearance of MH370, an interim report by the Malaysian government revealed a large shipment of lithium ion batteries was being carried by the Boeing 777. The report also mentioned the 221kg shipment was not security screened before being loaded on board MH370, but it was physically checked by cargo and customs officers. Experts have rejected theories of fire triggering the aircraft's sudden turn off course and subsequent disappearance. A Qantas spokesman said the airline had regularly carried small amounts (5kg of lighter) of lithium-ion batteries as cargo on both passenger and freight aircraft in the past. "We've made the decision not to accept shipments of lithium-ion batteries for carriage on the basis of an internal safety assessment, taking into account new information from aircraft manufacturers and regulators," said the spokesman. "Qantas is always conservative when it comes to safety and we often take action ahead of expected regulatory changes." A Virgin spokeswoman said they would also instigate a ban on all shipments of lithium ion batteries from March 31. "Recognising that UN3480 lithium ion batteries are essential for a number of life-saving medical devices, Virgin Australia will review requests for exemptions in such situations," she said. "These changes will not affect passengers who can continue to travel with electronic devices that include lithium ion batteries." Yesterday, Delta Airlines' president Ed Bastian said the ban on lithium ion batteries instigated at the start of the month did into represent a significant monetary loss for the airlines. (Bloomberg) -- Thousands of drones flown without government approval by real estate companies, movie studios and other businesses are getting coverage by insurers writing their own safety rules to fill a void left by regulators. One insurance broker in Colorado has already written policies on 2,600 drones, and a San Francisco-based company said it has assembled an Uber-like list of 1,000 trained operators businesses can hire to do the flying for them. Commercial drones are photographing sporting events, monitoring construction sites and performing other aerial chores even though the Federal Aviation Administration is as many as two years away from issuing final regulations to govern their use. The FAA, which won a legal ruling in November that said it could apply existing aviation laws to drones in the meantime, says none are supposed to fly without a formal waiver -- only 39 have been issued -- until then. In a Feb. 15 proposal to allow unmanned aircraft weighing less than 55 pounds (25 kilograms) to fly for hire, the FAA projected there would be 7,550 of them within five years of enactment. In reality, there are already more than that in the air now, according to insurers, aviation lobbyists and academics. "We've been insuring them for going on four years," said Terry Miller, owner and president of Transport Risk Management Inc., which had to invent safety requirements for its drone clients. Purchasing insurance for commercial drones, which isn't prohibited under FAA rules, doesn't make flying them legitimate, the agency said. Whether drone operators' actions are legal doesn't affect Miller's willingness to write insurance. He said that, while he welcomes more FAA oversight, there's no point in waiting for the rules to be completed and that the standards his company sets for insurance policies often exceed what the government has proposed. Such a disconnect between the FAA and an industry plunging ahead without regulators' approval raises questions about aviation safety and is testing the agency's ability to carry out its enforcement and oversight obligations. "There are thousands of companies already doing experimentation," said Christian Sanz, the founder and chief executive officer of Skycatch Inc., a San Francisco-based drone mapping company for mining and construction sites. Skycatch has even taken to crafting an automated system similar to Uber Technologies Inc.'s car ride-hailing service. For now, an education campaign by the FAA and its attempts to contact businesses to persuade them to halt unauthorized flights haven't always successful. Turning its proposal into a formal regulation under the mandatory process of sifting through public reaction can take years; the Government Accountability Office has penciled in 2017 as the earliest date for completion. "The FAA will investigate any reports of unsafe and unauthorized UAS operations, including incidents identified by the media," the agency said in an e-mailed statement, referring to the more formal name for drones: unmanned aircraft systems. The FAA said that existing aviation regulations, which apply to unmanned aircraft, give it the authority to ban commercial drone flights that haven't received waivers to operate. The agency has issued fines against an unspecified number of drone operators, it said in the statement. In other cases, the FAA has worked with law enforcement agencies to contact people who have operated drones that were unsafe or unauthorized, the agency said. Harry Arnold, owner of Detroit Drone, said he's hoping the FAA rules go into place as soon as possible. That hasn't stopped him from running a drone photography business for the last five years, he said, and won't stop him from continuing. "It is not illegal," Arnold said in an interview. "There are no rules yet." His website includes aerial video of real estate developments, construction sites and a car race. Arnold, who said he doesn't have an FAA waiver, disputes the agency's authority over commercial drone flights with regulations still incomplete. "The FAA cannot regulate through press releases," he said. "That's not the way it works." While some drone entrepreneurs may see their wings clipped once the FAA's new restrictions become finalized, tighter standards are good news for the sometimes chaotic, unregulated industry, Miller said. "I'm overjoyed to see it," he said. Before writing an insurance policy now, Miller requires a drone flier to develop standard operating procedures, just as a traditional charter-airline company must have. He also requires clients to keep logs of flights and maintenance, and to have at least a basic understanding of FAA rules for traditional pilots. "It's still in its infancy obviously, but it's becoming an industry where we're developing an infrastructure to support it and putting in place risk and safety-based systems," he said. Some of his standards exceed those in the FAA proposal, which says pilots would have to pass an aviation knowledge test and could only fly below 500 feet and within sight of the operator. There would be no requirements for logs or maintenance standards. Drone-policy businesses like Miller's are so new that Michael Barry, a spokesman for the New York-based Insurance Information Institute, said the industry is still trying to familiarize itself with drones and the new issues they create. For now, regulation of such businesses is up to state governments, which have oversight over insurers, not the FAA. The demand for training drone operators, driven in part by insurance requirements, is also growing rapidly, said Alex Mirot, president of the Unmanned Safety Institute in Maitland, Florida. While the company, formed just six months ago, has mostly trained law enforcement officers, a growing number of its clients are flying commercially, some of whom may not yet have government approval, Mirot said. "Our position on that is that if you really do care about safety in a general, broad sense, then excluding those who are not following the rules is not going to make the skies safer," he said. Douglas Marshall, who studies drones at New Mexico State University's Physical Science Laboratory, agrees with Miller and Sanz that there are far more commercial drones in the air than the 39 officially authorized to fly. "They are out there already," he said. "They are being used commercially daily, a lot of it under the radar." It ranges from Hollywood studios using custom-built drones for filming to "weekend warriors taking $75 shots for real estate agents," said Patrick Egan, an editor at the website sUASNews.com, who participated in the industry committee that advised the FAA on the rule proposal. While at least two companies using Skycatch drones have obtained waivers from the FAA to fly them on job sites, some companies that use its products may not have such approvals, Sanz said. Skycatch tells its clients they shouldn't use the drones for commercial purposes without FAA permission, he said. "What's changing is that there are hundreds of big companies putting operating budget into it," he said. "It's no longer R&D." Sanz said the project has been so successful Skycatch is designing an automated system similar to Uber's service to provide drivers for hire, so companies can easily find drone pilots for specific jobs. In the long run, people like Miller say having FAA regulations will help the industry and ensure safety. "We don't want to be giving credibility to pirates," Miller said. "If we're in this business, we want to have credibility and we want to be able to point to some rules rather than being the rule maker." A Ryanair flight was forced to make an emergency landing this morning after a fire extinguisher in the cockpit suffered a fault. Flight FR8321 from London to Valencia was diverted to Barcelona airport shortly after 10am this morning. The flight landed safely at 10.26am. A statement from Ryanair confirmed the flight was diverted "due to a minor fault with a cockpit fire extinguisher." "The aircraft landed normally and was inspected by a Ryanair engineer, who replaced the fire extinguisher and cleared the aircraft to return to service. "Customers remained on board and this flight has since departed to Valencia." Passenger and TV presenter Hannah White tweeted that the fire extinguisher went off in the cockpit during flight and "the pilot couldn't breathe". A spokesperson for Ryanair said the pilots followed standard safety procedure by putting on their masks, but said the fire extinguisher had a "minor fault" but did not "discharge". She also tweeted a photo from the runway in Barcelona, showing a series of fire trucks lined up outside the plane, and said the "stressful situation [was] dealt with brilliantly and resolved efficiently". Another passenger, Josh Adler, tweeted that the pilot was attended to by medics after the landing, but was in good health. COLORADO SPRINGS - Local pilots say they're under attack from people armed with laser pointers. Tuesday night a Sky West commercial jet reported a green laser being shined into the cockpit as they were flying into the Colorado Springs Airport. It happened around 10:00 and the pilot reported it coming from the Powers and Constitution area. The plane landed safely, but its something pilots are getting sick of. "Its like aiming or shooting a gun at you. You're under attack," said Al Mathews with Peak Aviation. It may not seem like that big of a deal, but when it comes to flying there is very little margin for error. "It only takes a second to be cockeyed when touching down or when not able to touch down at all," said Pat Carlile with Peak Aviation. "If they're blinded in a critical phase they could crash and the outcome could be disastrous. Lives could be lost," said Mathews. But it doesn't take a crash for the lasers to take a toll. Getting hit in the eye by a beam for even a short amount of time can cause damage and for pilots having good eye sight is crucial. "If my vision is affected I could lose my pilots license because I'm not safe to fly because of my vision," said Mathews. The FAA and the FBI are trying to crack down on these attacks by making arrests when they can and its not a slap on the wrist. It's a felony that comes with a $10,000 fine and possible jail time. But the owners of Peak Aviation said its still not enough. "Seems to be happening a lot more often and it's a serious consideration for us," said Carlile. Because of that, they're hoping technology will soon be advanced enough to protect them. "I think there's some technology that they're trying to incorporate into windshields that might help mitigate the effect of the laser beams, but right now we don't have that technology," said, Carlile. To give you an idea of how often this is happening, in 2012 there were nine cases in Colorado Springs, then in 2013 it jumped up 13. The airport wasn't able to get us numbers for 2014, but pilots said they think its only getting worse. When a pilot ignores an audio alert, why does it happen? It could be a ground proximity alert, or a warning that the cabin pressure is rising, or that the gear is still up while the aircraft is on final approach. But what's going on in the pilot's brain that makes him act as if the alert doesn't exist? A group of French scientists at the Institut Sup�rieur de l'A�ronautique et de l'Espace in Toulouse is researching pilot physiological and neurological reactions to stress, with the objective of recognising the signals that precede potential error in order to understand and prevent it. Backed by the AXA Research Fund, the ISAE is working to identify the patterns of neurological activity that occur when pilots become confused, overloaded, or focused on non-critical inputs to the exclusion of critical ones. This confusion can result in illogical actions, leading to accidents like controlled flight into terrain or loss of control. Tools used to monitor pilot reactions during flight simulator exercises - and real flights also - include eye-tracking, measurement of pupil dilation, observing deep brain activity via electro-encephalogram readings, and surface brain areas via infrared sensors. Heart rate also indicates the levels of stress and workload. For example, pilots will not be surprised to learn that a take-off in a simulator does not raise the heart rate to the degree it does in a real aircraft! Prof Frederic Dehais, who holds the AXA chair of neuroergonomics for flight safety at ISAE SUPAERO, says even factors such as "emotional bias" can be recognised. This can be caused, for example, by pilot perception of commercial pressure to land when a go-around would be wiser. They have tested pilots by offering them a financial benefit to land versus a small financial penalty for a go-around, and then observed in their brain a greater degree of neurological stress during the decision-making process. As wired-up pilots are given progressively higher workload tests, neurologists can watch as the rational part of the brain deactivates. This is the state in which pilots, for example, ignore loud alert chimes. Knowing, as neurologists now do, which parts of the brain control specific functions, the ISAE scientists can predict which tasks the pilot will no longer be able to perform as the stress increases. Of course there are traditional ways of helping pilots deal with stress. Good training and high levels of knowledge in a pilot mean that he or she is less stressed by any given situation than a pilot with poor training and knowledge. But the ISAE is looking beyond the traditional to what else will be effective. This new level of "neuro-ergonomic" understanding promises to enable manufacturers to eliminate alerts and other stimuli that do not work, and develop completely new systems for attracting the attention of pilots whose cognitive capacity has been swamped. Such as a window appearing on the navigation display showing an animation of a pilot carrying out the required action. Neurologists know that, when all else fails, they can invoke the imitative function - the one that makes you yawn when someone else yawns. The potential of this study is totally fascinating. Where could it lead, and what effect could it have on the industry? It could affect everything from pilot selection to monitoring the effectiveness of training techniques, or the effectiveness of different cockpit designs. It could eliminate speculation about whether pilots who work for airlines that require them to be self-employed and paid by the hour are under more stress than pilots who are real employees. Indeed the accuracy of these neurological observations is such that they might be predictive of the kind of mistakes these pilots are more likely to make. It could identify the cumulative effects of bleed air fume events on a pilot's brain functions which, backed up with blood tests, could help eliminate many of the unknowns about this disputed condition. This may be a mischievous thought, but could this study end up by causing cockpits, as an in-flight emergency develops, to default into the aviation equivalent of a nursery, with all the cues presented, Disney-like, to stimulate imitation by pilots who have lost the plot? Whatever the ISAE discovers, this research project has incredible potential to advance mankind's understanding of aviation human factors. EASA has commissioned a pair of German organisations - one a medical school and the other an applied research establishment - to research cabin air quality. The agency says the research will start with in-flight work to identify suitable instrumentation to measure cabin and cockpit air contamination. Once the instrumentation and testing methodology has been established, EASA says it will carry out a larger-scale test programme on board commercially-operated large transport aeroplanes in the near future. Measurements will be taken in the cockpit and passenger cabin during all flight phases. The EASA research contract has been awarded to a consortium made up of research establishment Fraunhofer and the Medizinische Hochschule Hannover (MHH). Both are based in Hannover. EASA's call for research bids states: "The quality of the air that passengers and air crews are exposed to on board commercial transport aeroplanes has been the basis of a continuing debate over the last 60 years, both from the health and safety points of view. Discussions about cabin or cockpit air quality need to differentiate between single cabin/cockpit air contamination [fume] events and the cabin air composition in normal operating conditions, for example the composition of the cabin air in the absence of any abnormal event and which can be compared, for instance, to the composition of the outside air or to the air at other workplaces." The project is expected take 20 months from taking measurements to analysis of the results. Results are expected in October 2016, says EASA, adding that the final details of the project - including the complete list of the aircraft types that will feature in the research - are still to be decided upon. A Kenya Airways flight. Strike planned to start on Wednesday next week over pay dispute. Kenya Airways have denied claims that they plan to sack 10 pilots to cut costs. The Airline said that the ten pilots were set for retirement and not sacked. 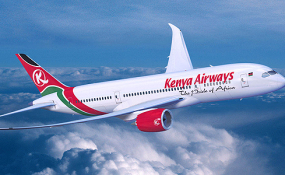 "They were all set to retire in the near term and the notice letters were issued as part of the reduction in the B777-200 fleet in accordance with the Collective Bargaining Agreement signed between KALPA and Kenya Airways," said Senior Account Executive Wathira Mbage in a statement on Wednesday. Mbage said that the senior pilots, aged between 62 and 65 have been employed by the airline for several decades and are expected to retire with full benefits. He added that Kenya Airways announced the decision to sell off its B777 -200 fleet in November last year and keeping the newer B777-300 fleet. This comes after KQ pilots were expected to start a go-slow on Thursday to protest recent sackings of their colleagues and possible salary cuts for others. The employees said that the go-slow follows a directive by their union. KQ employees who spoke to the Star on Tuesday on condition of anonymity for fear of victimisation, said the pilots are "withdrawing goodwill" to protest the recent move by the airline to force 10 pilots assigned to B777-200 jets into early retirement. Two of the pilots allegedly received their termination letters only hours before they were due to fly home on return flights. The pilots said KQ threatened the safety of the flights since the news could have adversely psychologically affected the captains Most of the pilots fired, sources said, are among veterans at the airline, some of them with over 40 years' experience. "I would like to bring to your attention the fact that Kenya Airways HR have started handing out forced early retirement letters to our senior members. This is despite our protests on this kind of action as there is no justification for it other than the usual 'haemorrhage' story," states a letter by the Kenya Airline Pilots' Association to its members. The letter, dated March 10 and signed by Kalpa secretary general Ronald Karauri, states that the move by KQ is "unacceptable" and calls for action by other pilots. The active business jet fleet is expected to experience strong growth over the next two decades, the FAA says in a newly-released forecast. At the same time, however, the piston-powered aircraft fleet is expected to decline slightly over the same period, the FAA projects. Recovery in the business jet market has been slow, and 2014 marked the first year of shipment increases by U.S. manufacturers since 2008, it noted. "The forecast calls for robust growth in the long-term outlook, driven by higher corporate profits and the growth of worldwide GDP, though at rates slightly lower than those predicted last year," the FAA said. "Continued concerns about safety, security and flight delays keep business aviation attractive relative to commercial air travel." A significant portion of piston aircraft flight hours are used for business purposes as well, it said. "We predict business usage of general aviation aircraft will expand at a faster pace than that for personal and recreational use," the FAA said in its forecast. "Increased demand for turboprop aircraft also contributes to increased turbine fleet and hours." The business jet fleet is projected to grow at an average rate of 2.8% a year from 2014 through 2035, growing to a total of 20,815 aircraft, the FAA's forecast said. Overall, the active general aviation fleet is expected to grow at an average annual rate of 0.4% over the 21-year forecast, from an estimated 198,860 aircraft in 2014 to 214,260 by 2035, it said. The fixed wing turbine aircraft fleet is expected to grow 2.2% a year, while fixed-wing piston-powered aircraft are expected to decline 0.6% on average per year. The rotorcraft fleet, however, is expected to grow an average of 2.5% per year. The number of general aviation hours flown are forecasted to grow at an average rate of 1.4% a year, from 23.1 million hr. in 2014 to 30.6 million hr. in 2035, the forecast said. Fixed-wing aircraft hours flown are expected to grow 2.9% a year, while fixed-wing piston aircraft hours flown are projected to decline at a rate of 3% a year. The FAA projects faster growth in hours will occur after 2023, with increases in the fixed wing turbine aircraft fleet and increasing utilization of single and multi-engine piston aircraft as the aging fleet starts to slow down, it said. In the medium term, much of the increase in hours flown will reflect strong growth in the rotorcraft and turbine jet fleets. In addition, declining fuel prices will slow down the decrease in piston flight hours over the short-to-medium term. WASHINGTON - The KC-46A Pegasus tanker program director is "not comfortable" saying the tanker's first flight will happen as planned in April. Brig. Gen. Duke Richardson, program executive officer for tankers, told an audience Tuesday that he is now targeting a more general date of second quarter of this calendar year, which extends to the end of June. "What I'm trying not to do is get fixated on days," Richardson said at the CreditSuisse/McAleese conference, held annually in Washington. "I feel more comfortable saying second quarter calendar 15. I feel more comfortable with that." The KC-46A will replace the majority of the service's current tanker fleet with 179 new planes, based on a Boeing commercial design. The contract protects the Air Force from major cost overruns on the way to having 18 planes ready to go in 2017. The first engineering, manufacturing, development (EMD) configuration flew in late December, while first flight of a full-up KC-46A had been scheduled for April. That now appears to be slipping. Richardson acknowledged that there are schedule pressures driving the tests, noting that the six-month margin that had been built into the tanker EMD phase has been used up. "I take that very seriously," he said. "I'm working pretty darn hard to pull some schedule margin back in." Because of that tight schedule, Richardson said he wants to get the first flight up as soon as possible, regardless of whether the tanker is in its final configuration or just one that meets the requirements for first official flight. "As soon as we can get it up, we need to get it up," he said. "We need to do what's needed so it can fly safely, but ... I'm not looking for the perfect airplane. I'm looking for a safe airplane so I can get it up and start collecting the air worthiness data." A spokeswoman for Boeing, the prime contractor on the tanker program, said the company is "working hard every day to get ready for that first flight and have a good team in place putting forth the effort to keep it on track and moving forward... it will fly when it's ready." It wasn't all bad news from Richardson, who said overall the program was "very healthy" and has benefitted from "incredible" requirements stability. He also highlighted two potential foreign sales opportunities: a direct commercial sale to South Korea and a foreign military sale to Japan. Korea is expected to downselect its choice of tanker in May, while Richardson said he expects an RFP from Japan sometime in April. Boeing Business Jets selected Jet Aviation's Basel, Switzerland, facility to complete the interiors of a pair of 777-300ERs ordered by an undisclosed client in Asia. The project is due to be completed during the third quarter of 2018, with the work due to begin before the end of March. "We have invested heavily in process and product improvements for popular widebody platforms such as the B777 in order to bring VIP interiors to the next level of quality and precision," said Matthew Woolaston, Jet Aviation Basel's director for market development and completion sales. "This is a fantastic opportunity for us to showcase our new capabilities." Jet Aviation, which has been in the completions business since 1977, has completed 25 Boeing interiors since 1999. Flymojo's fleet of Bombardier C100 passenger jets will seat up to 150 passengers each. Following a string of air disasters, the Malaysian government announced plans Tuesday to create a new airline called flymojo. The new airline has already signed a $1.5 billion deal with Canadian aircraft company Bombardier for 20 new planes. Malaysia is reeling from three major airline tragedies in the past year, including one of the world's greatest aviation mysteries. The most recent incident was a flight operated by its discount carrier AirAsia, which went down in the Java Sea with 162 people on board in December. In July, Malaysia Airlines flight MH17 was shot down over eastern Ukraine in July, killing all 298 passengers and crew. Meanwhile, various governments and private search parties are still scouring the southern Indian Ocean for traces of Malaysia Airlines flight 370, which disappeared with 239 passengers and crew in March 2014. The new carrier will not replace Malaysia Airlines. Flymojo's fleet of Bombardier C100 passenger jets will seat up to 150 passengers each. The new airline will fly between the Malaysian cities of Sabah and Sarawak, as well as other key cities in the region. Its main hub will be Senai International Airport in Malaysia. 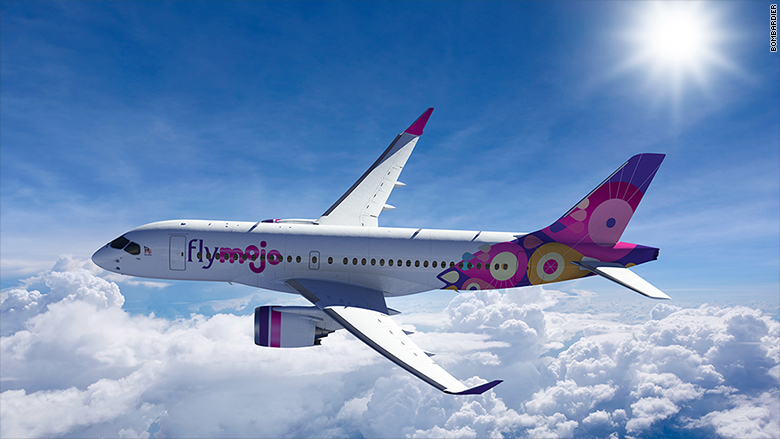 Alies Anor Abdul, chairman of flymojo, said the airline's goal is to make air travel "a much-anticipated and longed for experience," adding that the company is dedicated to "putting the human touch back into flying." The new airline was announced by Malaysian and Canadian officials at an industry event in Langkawi, Malaysia.